Praktina IIA with CZJ Flexon 2.0/50. 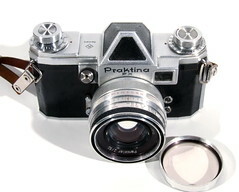 The Praktina is a 35mm SLR film camera launched in 1952 by KW located in Dresden, East Germany, the cradle for modern camera industry and optics. KW was the first manufacturer to make the SLR camera a practical proposition for the advanced amateur by introducing the Praktiflex in 1939. The giant Zeiss Ikon certainly entertained the idea at that time, but it was never realised as originally envisaged. Some ten years had to pass before the KW Praktica and Contax S emerged from Dresden. Then the Praktina shortly followed. But this camera was far ahead of the competition, sporting a new breach lock lens mount, solving many of the problems related to the lens mount precision and wear. However, the new lensmount required special Praktina lenses. The interchangeable pentaprism finder was an integral design feature, while the seemingly redundant direct vision optical finder would be helpful under special conditions, like when using a waist level finder or a manual preset lens. 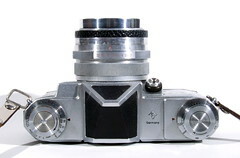 The shape of the camera body is obviously obtained directly from the Contax S, but the back is not hinged for easy attachment of the Bulk Film Magazine for 400 exposures. Several remarkable features, apart from those already mentioned, are associated with this camera. It was the first SLR camera prepared for a motor drive, at first a spring driven one for some twenty frames was offered, but later a battery powered electric motor drive was available. Praktina FX with CZJ Pancolar 2.0/50. 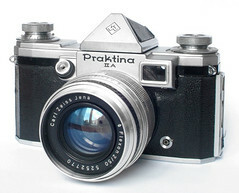 The original Praktina was replaced within a year by the improved Praktina FX. It featured automatic lens stop down at shutter release, and two standard PC sync contacts replaced the original three contacts. A wide range of all kinds of accessories was available. 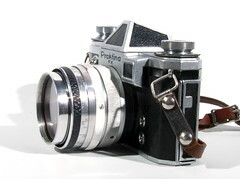 For the remaining part of the 1950s, the future for the Praktina looked bright, but a new era in the realm of camera history emerged; a situation the introduction of the slightly improved Praktina IIA in 1958 had little effect. praktina.com, a site about Praktinas.